Here we thought the Phoenix show at Madison Square Garden was already dominating the CMJ conversation. 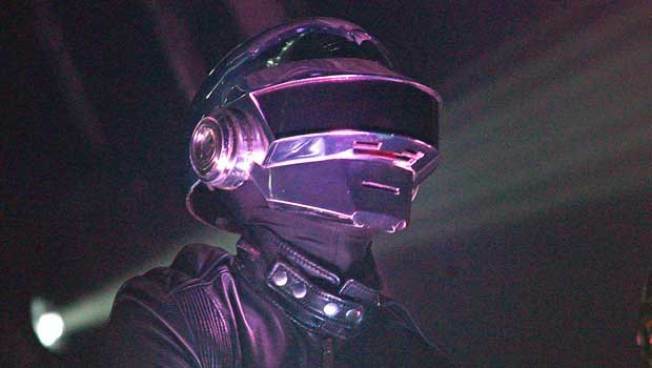 Last night the dangerously catchy Parisian pop purveyors got an assist from another French export when elusive electronic maestros Daft Punk dropped a beat during the encore. The acts go back: Phoenix guitarist Laurent Brancowitz and Daft Punk duo Thomas Bangalter and Guy-Manuel de Homem-Christo played in a (mercifully) short-lived band called Darlin' before moving on to their current projects in 1995. Legend has it that one cranky London music critic panned their show and called Darlin' a bunch of "daft punks," proving that even the most savage criticism can be constructive. Fast forward 15 years and the Darlin' boys are back at it, albeit joined by a few friends, and blowing up New York City's biggest stage. How's that for an improbable reunion? Not even a winning Knicks season could provide a more compelling MSG narrative. Encore highlights included Daft Punk kicking things off with the anthemic "Harder, Better, Faster, Stronger" before jamming with Phoenix on their smash hit "1901." Of course the haters inevitably griped; since Daft Punk wore their trademark masks, some jaded commenters speculated it wasn't actually them. But given the shared history of the two Gallic rockers, we're sold. The only people inside the Garden who could possibly complain? Opening acts Wavves and Dirty Projectors, whose thunder, we must say, was stolen. Thankfully, CMJ affords them numerous opportunities to stage their own Darlin'-esque comebacks. See video here and here. Billy Gray is a Deputy Editor at TheFeast.com, a new lifestyle franchise being launched by NBC New York later this year.